This Saturday we will be hosting a Pickleball Demonstration and a learn to play as well as opening the courts for anyone that already knows how to play! We will have staff on hand giving a demonstration at 10am and showing how the game is scored, played, etc. After the Demonstration we will be having games for anyone that would like to try the sport out. We will be keeping a court open for our already advanced Pickleball players! We have extra rackets so don’t worry about getting your own! In addition to the Demonstration on Saturday the Courts will be open going forward for anyone that would like to use them. 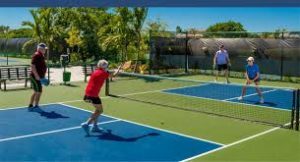 Beginning on Tuesday, October 9th we will have them staffed from 9am – 12pm Monday – Friday with Pickleball volunteers who will be on hand to help teach the game!